The once-vast flower beds of California’s Central Valley that Muir described were paved over and plowed under a long time ago. Yet there is a small corner of California that, in a good year, still resembles Muir’s descriptions: the Carrizo Plain. This remote, dry valley lies west of Bakersfield, separated from the San Joaquin Valley by the Temblor Range. 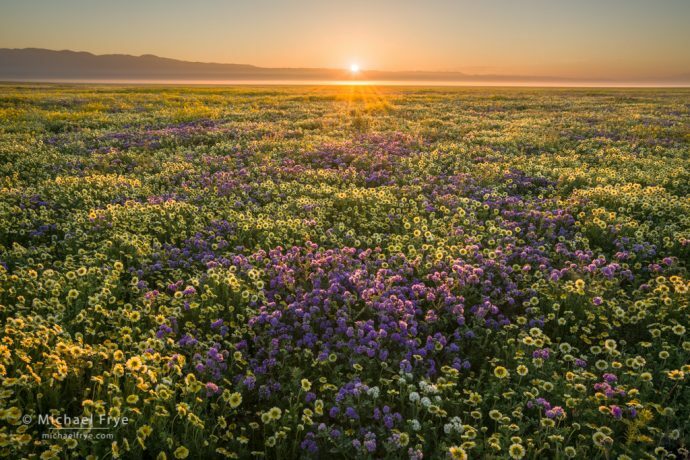 There was never much development in the Carrizo Plain, and most of it remained ranch land until 1988, when the BLM, California Department of Fish and Game, and the Nature Conservancy joined together to purchase an 82,000 acre parcel of land, with the intent of preserving the plain’s unique ecosystem. This area became the Carrizo Plain Natural Area in 1996, and subsequently President Clinton established Carrizo Plain National Monument in 2001. The monument now encompasses 250,000 acres. Most of the year the Carrizo Plain is a hot, brown, parched grassland, with hardly a tree in sight. 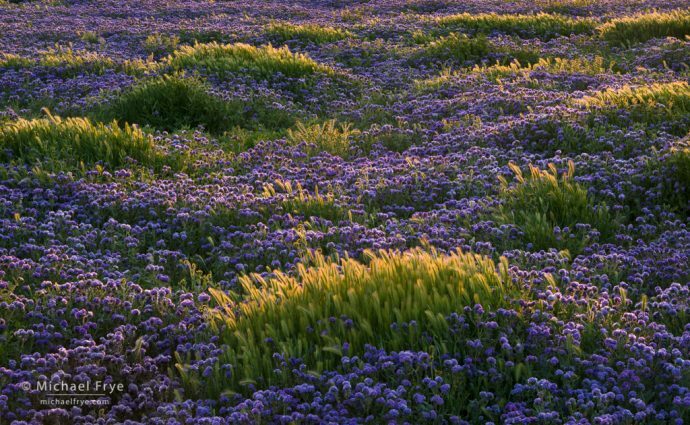 But in spring, after above-average winter rains, it can have some of the best wildflower displays in California. Claudia and I camped there last week with our friend Robert Eckhardt, and we marveled at the vast fields of flowers. We found acres and acres of tidytips, phacelia, hillside daisies, fiddlenecks, and goldfields, growing together in dense mats, uninterrupted by shrubs or even a blade of grass. 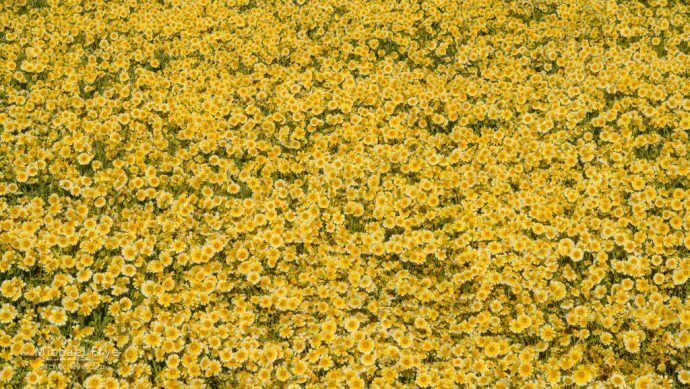 We had to tiptoe carefully to avoid crushing, in Muir’s words, “a hundred flowers at every step.” We also saw vast tracts of deep-yellow coreopsis, and in the middle of the monument we found a large, purple lake of valley phacelia. We saw pronghorn antelope and tule elk, both reintroduced to this area. A herd of seven pronghorn came by soon after I made the photograph at the top of this post, snorting at our presence. One night, driving back from a hike into the Temblor Range, we saw three San Joaquin kit foxes (an endangered species), along with countless kangaroo rats (probably the endangered giant kangaroo rat). It truly seemed as if we’d stepped back in time, and were seeing what the Central Valley looked like 200 years ago. Of course we went there to photograph flowers, and had a great time doing so. We found an endless array of potential subjects, and although we camped there for four nights, it seems as if we barely explored all the possibilities. One of our favorite subjects was the tidytips. These daisy-like flowers, with yellow centers and white tips, have to be among the world’s most cheerful-looking flowers. We found extensive mats of tidytips, sometimes in pure stands, sometimes mixed with phacelia, hillside daisies, or fiddlenecks. In photography it always helps to know your subjects. 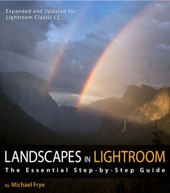 In landscape photography, the better you know an area, its potential subjects and viewpoints, and its weather patterns, the better your odds of being in the right place at the right time. When photographing wildlife, the more you know about an animal’s habits and behavior, the better you’ll be able to anticipate where to find your subjects, and what they might do next. We don’t think of flowers as having behavior, but they do move. Many people know that California poppies only open in sunlight, and evening primroses only open at night. Did you also know that many daisy-like flowers turn to follow the sun throughout the day? This was true of the tidytips, hillside daisies, and coreopsis in the Carrizo Plain. In fact the tidytips anticipate the sunrise, and turn to face east before the sun comes up – as you can see in the photograph at the top of this post. That was actually my second attempt at photographing sunrise from this area. The first time the temperature was lower, and all the flowers were drooped over and coated with frost. They eventually perked up when warmed by the sun, but I didn’t get my sunrise photo that day. We thoroughly enjoyed our time in the Carrizo Plain. For a few days we were immersed in a flower-filled paradise, a beautiful remnant of what much of California once looked like. You’ll find some more of my photographs below. We also made a couple of hikes up into the Temblor Range, which was, perhaps, even more spectacular than the valley below. I’ll post some photos of the Temblors soon. P.S. We didn’t see many clouds, so aside from a few sunrise or sunset images I concentrated on photographing more intimate scenes. Most of these were captured with telephoto lenses, and it often challenging to get everything in focus, so I used focus-stacking for many of the images. I’ve included extended captions to explain how these photographs were made. 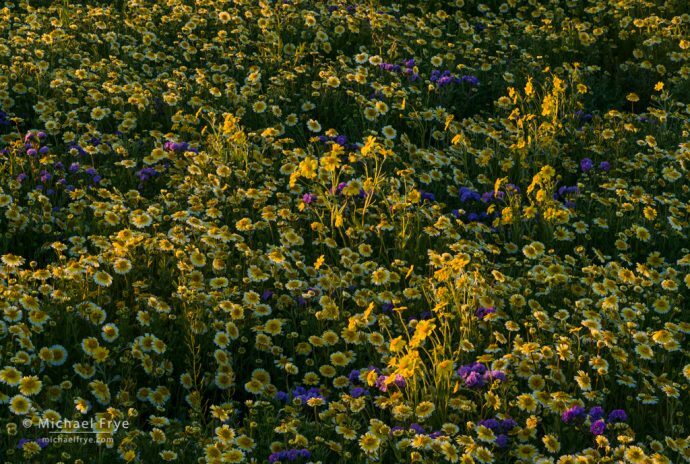 Hillside daisies, tidytips, and valley phacelia in late-afternoon light, Carrizo Plain National Monument. I rarely photograph flowers with sidelight, but these sidelit hillside daisies caught my eye, poking up out of a sea of tidytips and phacelia, catching the late-afternoon sun. 106mm, 1/4 second at f/16, 100 ISO, focus-stacked. Wall of tidytips, Carrizo Plain National Monument. I had been concentrating on photographing tidytips with backlight, but then decided to turn around and see what they looked like with frontlight. They looked great, forming wonderful patterns. I picked out a particularly dense patch and zoomed in to fill the frame. 135mm, 1/45 second at f/16, 100 ISO, focus-stacked. 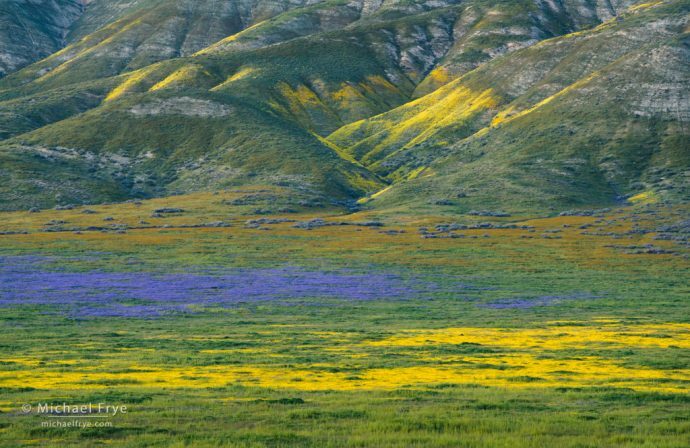 Wildflowers and hills of the Temblor Range, Carrizo Plain National Monument. I used a small hill to get a slightly-elevated view over this sea of flowers toward the hills beyond. 183mm, 8 seconds at f/11 (it was dusk), 200 ISO. Waves of foxtail grass amid a sea of valley phacelia, Carrizo Plain National Monument. One afternoon we walked out toward the purple lake in the middle of the monument. Near the edge of this lake we found the phacelia mixed with some beautiful foxtail grasses, backlit in the warm, late-day light. 127mm, 1/6 second at f/16, 100 ISO, focus-stacked. Beautiful, as always! I did my first focus-stacking a couple weeks ago, thanks to the helpful instructions in one of your earlier blog posts. So thank you for that. It was a technique I had wanted to try for a long time and your post with the easy instructions motivated me to do it. Thanks Bev! And I’m glad you had some success with focus-stacking. Great photos Michael! I was out there last weekend and may go back one more time this season. I’m just glad I had already intended to go and am leaving tomorrow since now everyone will be heading there. Well everyone is already there Connie. It was a zoo last weekend. But it’s a big place. Amazing set of images Michael. Sunrise and sunset light do make big different. I have chance to visit this area for the first time yesterday, just a quick walk through with friend who’s just enjoyed to photograph the scene with her in it so I don’t really had chance to explore the area in depth. Your images make me want to come back before season is ended. Here’s my quick snap from the trip. Thanks Anna, and I hope you get a chance to go back. Gorgeous images, oh, that light! Was there just for the day last Thursday in heavy overcast, but what a glorious day hiking in the hills. Looking forward to your images from uptop. Thxs for a great post & continued learnings & inspiration. Thanks Cindy! I would have loved some overcast. s there are also starting to show large patches of flower on the hillsides. Our California “Painted Hills”. Ah, that’s a great area. Maybe I’ll get a chance to check it out. Beautiful series in all respects! Thank you for sharing your photos. We have gone to Caliente Ridge for Easter many times, and always enjoy the colorful splendor of the painted hillsides of the Carrizo Plains. Viewing the slippage along the fault line to the east fascinates all who see it from the ridge on the west side of the valley. On our last visit we were treated by camping under a tree with a great horned owl nest, and enjoyed the owlets, anxiously waiting for Mom to return with breakfast. Missed our trek this year, but these photos made up for the missed adventure. Thanks for sharing your story Annis, and I’m glad you enjoy that area. Absolutely stunning! Looks like lots of fun. Thanks Hugh – it was indeed a lot of fun! Great article Michael. I drove through there today on my way from Mariposa to LA. Still beautiful. I’m planning to drive through again tomorrow on the way home and wondered if you recall which road you were on when you took the wildflowers and trembler range shot with the blue and gold flowers. The visitor center was closed by the time I got there and I’ll be rolling through at about dusk tomorrow. Thank you Dave. I was on the southern part of Elkhorn Road. Beautiful, Michael – and I’m envious as when I was returning from Arizona, the only flowers that were carpeting everywhere were Antelope Valley and parts of Anza Borrego, although that was past peak and mobbed with people. Nonetheless, I had a great time with Antelope Valley area – it’s a joy to be surrounded by flowers! Lucky you to find this small hill to get an elevated view of the field below the Temblor range; I find it frustrating that so much of the C. Plain is fenced off at the road, except by the campgrounds., in particular one that sits up behind some mounds. But then the flowers weren’t there when I was there last year! Thanks so much Brenda! I’m a little puzzled though by your comment about fences, as I don’t remember finding many fences in the way. There are fences, to be sure, but in the middle of the monument there are huge flower-filled tracts (or there were this year) without any fences. There are some fences along the eastern side of Elkhorn Road in places, and some of that is apparently private land, but there are few signs, and it’s hard to tell what’s public and what’s private over there. So many of the best flower spots in California are on private land, and I’ve taken a lot of photos from roadways looking over fences, so I actually found it refreshing that I could roam around freely in many places in the Carrizo Plain. Gorgeous! Gotta go now along with the other masses, I guess. Michael, for this stacking shot (especially first two images above): Did you set your camera to take 5-shots 2 steps apart in one action or 5 separate trigger shots? I am wondering because if it was 5 separate shots, I would be concerned with movement of flowers stacking on each other…? Thanks Tom! Just to be clear, these photos were made almost two months ago, so the flowers are long gone. To answer your question, I used auto-bracketing, and with my Sony camera I can set it so that one press of the shutter activates the entire auto-bracketing sequence after a two-second delay. 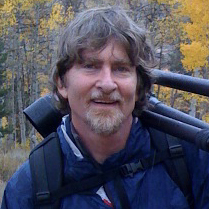 But even with auto-bracketing, any wind would be problematic when blending the exposures. The same goes for focus-stacking. So calm conditions are required. I’m heading to Joshua Tree later today for sunset which is 6:59 today. what time would be optimal to get there and can u suggest a particular locatoon. Never been there before. It’s blue skies w clouds today. What time should you get there? At least an hour ago so you can scout locations! We found the most flowers near the southern entrance, but that was a week ago. its a whole different experience traveling w a non photographer. We entered SW. Mostly yellow..caught a nice sunset. plan to go back alone for a hike.